'Pitfall: The Mayan Adventure’ is a platform action game; a sequel to the well known Atari 2600 game. While it may remind us of a certain PS4 exclusive that features a wise cracking treasure hunter, is this a relic that is worth unearthing? I’ve recently become hooked on ‘Epic Mickey: Power of Illusion’. While it shares a name with the ‘Epic Mickey’ 3D games released a few years ago, this 3DS game is actually a sequel to the Mega Drive Classic ‘Castle Of Illusion’. It’s a 2D platformer, but built for a modern system. It’s includes music and gameplay mechanics from the 1990 Sega prequel but introduces elements that today’s gamers expect. While it may have remixed versions of the fantastic 16 bit Mega Drive music, it has continue points, it saves your progression and it also has touch screen inputs. ‘Power of Illusion’ is a game made deliberately to please those who loved the earlier 16bit ‘Illusion’ games. But it’s not the only modern game designed to court players who loved older games. Massively popular titles like ‘Shovel Knight’, ‘Retro City Ransom’ and ‘Golf Story’ are modern games made with one foot in the past. The internet is also awash with “De-makes”; fan made versions of modern games restricted by the technical limitations of older consoles. While many of these are incredibly impressive I couldn’t help but wonder what my favourite PS4 games would be like if technology had been frozen in time. So I went on a mission to see if there were already existing 16 bit games that foreshadow the games I love to play today. Obviously prequels in the same series share the same DNA. ‘Super Mario Odyssey’ on the Switch has sections where you play ‘Super Mario Bros’ like levels with the familiar NES visuals. But what would a game like ‘Uncharted’ have been like back in 1994? This was the year that ‘Pitfall: The Mayan adventure’ was published by Activision. The game is a platforming action sequel to the original Atari 2600 ‘Pitfall!’ game and the key elements of the game will be familiar to fans of Naughty Dogs’ incredible series. You explore environments, swing on vines, ride vehicles, find treasure, kill enemies with explosives and rescue someone close to you. There’s nothing here that Nathan Drake hasn’t got used to doing. Much like Drake at the end of ‘Uncharted 4’, Pitfall Harry, the hero of the original game, has settled down to raise a family. Like Drakes’ daughter it seems the apple hasn’t fallen far from the tree though as Pitfall Harry now has an 18 year old son, who he has christened Harry Junior. As we start the game Harry and Junior are searching for an ancient Mayan relic, but surprisingly when we meet them they are at the e nd of their adventure. The treasure has been discovered but tragically this has led to the capture of Pitfall Harry; taken prisoner by an awoken warrior spirit. So the adventuring batten has been passed and now it's up to Junior to rescue his dad. 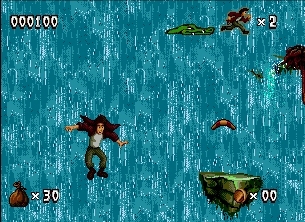 ‘Pitfall: The Mayan Adventure’ is a massive game with a dozen levels and a handful of excessively tough boss fights. Unlike the first game were you simply moved from one side of the screen to the other, most of your time in the sequel is spent navigating scrolling multidirectional labyrinthine stages. While the background may change, you’ll predominantly be doing a similar thing, crawling through holes, swinging across wall pegs, hanging off zip lines and racing along tracks in mine carts. 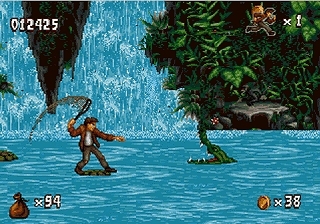 Of course with this wouldn’t be a ‘Pitfall!’ unless you also had to use crocodile heads as stepping-stones. Bungee chords occasionally appear, with which you’ll have to time jumps to get flung up to higher areas. It’s an initially quite frustrating task, but a required one, as mastery of all the level features is the only way to reach leavers and switches. Like a modern ‘Tomb Raider’ game, flicking a switch opens a previously restricted section which usually leads to the next stage. Clearly this sequel is a world away from the astonishing simplicity of the original ‘Pitfall!’ In 1982, David Crane designed the first game’s central premise in minutes. “I sat down with a blank sheet of paper and drew a stick figure in the centre” crane once told Edge Magazine. “I said, ‘Okay, I have a little running man and let’s put him on a path’ (two more lines drawn on the paper). ‘Where is the path? Let’s put it in a jungle’ (draw some trees). ‘Why is he running?’ (Draw treasures to collect, enemies to avoid and so on). And ‘Pitfall!’ was born. This entire process took about ten minutes”. Junior is an agile protagonist and if anything the range of abilities initially seems daunting. The d-pad moves him, with jumping mapped to the B button. Your primary attack, an Indiana Jones style whip can be unleashed at the press of the C Button but other more devastating weapons can be found on a context sensitive A button. With this one button, stones, explosives and boomerangs can be flung as tapping the start button changes its function. The flaw is obvious here; hold down the start button too long and you pause the game. This isn’t game breaking it does break the game’s flow. Thankfully on a six button controller (or on the Snes version of ‘Pitfall: The Mayan Adventure’) each weapon has a dedicated button which allows for much more elegant play. To avoid over powering the player these three special weapons are limited but you can pick up extra ammo as you progress through the game. Additionally, Chilli Peppers give you temporary super strength meaning you can run faster and jump farther; although for me this was a hindrance as it made the controls feel loose and imprecise. GamePro Magazine however believed unresponsive controls were an issue throughout the game. "The split-second lag time between his jump and your ability to control his movements [...] is the difference between a narrow escape and losing a life. The same problem occurs whenever he changes direction - he pauses, you can't control him, and Harry Jr. takes a hit." Many other reviewers agreed calling Junior “clumsy”, “unresponsive” with “floaty” jumps. However despite their criticism GamePro were insistent that “Control difficulties shouldn't keep fans of non-stop adventure games out of this jungle”. Not only is Junior tricky to control he is also exceptionally fragile. You will likely die a lot as ‘Pitfall: The Mayan Adventure’ is brutally hard in places. Enemies re-spawn alarmingly quickly and several sections demand a string of perfectly timed jumps over instant death pits. unless you keep an eye out for life restoring hearts the idol checkpoints feel frighteningly far apart. reckless play ultimately leads to having to replay the same section of the level. ‘Pitfall!’ didn’t feature any boss fights and in all honestly ‘Pitfall: The Mayan Adventure’ would have been better off if it also lacked them. The best 2D platform game bosses have a discernible attack pattern and there’s a huge amount of satisfaction when you learn when to jump, dodge, or attack. In ‘Pitfall: The Mayan Adventure’ the timing of the boss attacks seems illogical and random. To make things worse, the attacks themselves are often cheap where developers are under the mistaken impression that unavoidable death makes the game challenging rather than frustrating. For example, if you want to avoid the speedy charge of a jaguar, you need to start a jump before the creature has even appeared onscreen. But the frustrations aren’t limited to one boss. Across the whole game if you get hit by any bosses' attack, Junior will likely get back up only in time to get hit again. There’s a reason why most other games offer two seconds of invulnerability. Similarly the most efficient way to kill a boss is to use your exploding weapons but these aren’t restored when a life is lost. If you fail to kill a level guardian on the first attempt you’re so ill equipped on subsequent tries that it’s almost worth starting the level again. Throughout modern ‘Uncharted’ and ‘Tomb Raider’ games there are copious amounts of treasure hidden throughout the adventure. There’s no real reward for finding them all, all you get is a virtual trophy and the satisfaction of knowing you have explored all the games have to offer. 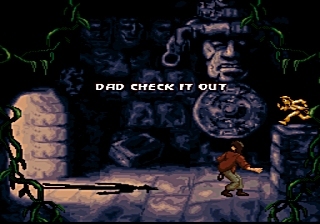 Similarly (and like the original ‘Pitfall!’) threes also many items you can collect throughout ‘The Mayan Adventure’. golden bars, silver trinkets and diamond rings are scattered throughout the stages and finding them earns a player points which will eventually earn a continue. However, there’s a far greater prize to be found In the level "Lost City of Copan". Look hard enough and you’ll find a secret portal that will lead to a playable version of the original ‘Pitfall!’. While I believe it’s aged terribly over the last three decades, it’s still nice to see the origins of this game. David Crane (the original creator of ‘Pitfall!’) is not a fan of any of the sequels to his seminal work. 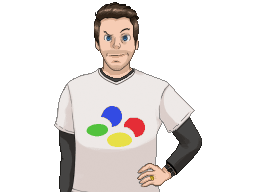 “I consider the newer games just “a different game with the name ‘Pitfall’ on it” he once said to the Arcade Attack website. 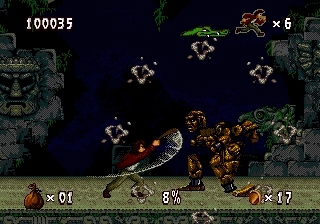 However, while Crane may not acknowledge it, clearly there has been a conscious effort to capture the originals game’s spirit in ‘The Mayan Adventure’. “Scorpions from the original game will occasionally escape from the "past" and appear in the new game” noticed Video and Computer Games Magazine. “Seeing a pure white, pixel-blocky scorpion crawl into a 16-bit world of lush colors and superb animation is the ultimate example of just how far video games have come in [a] decade”. They weren’t a lone voice. Critics universally celebrated the game’s graphics on both 16 bit consoles. GamePro felt the Nintendo version has "some of the best character animations ever seen in an SNES game." “The overall package is so artfully presented” noted Electric Playground. “’Pitfall’ looks gorgeous” added EGM, “especially its fluid character animation”. Game Fan Magazine even said the game had “‘Aladdin’ quality animation”. with similar character size and proportions it’s easy to believe that the artists making ‘Pitfall’ were inspired by the sprite work done by Disney animators for David Perry’s celebrated game. The background look great but they are more comparable to ‘Flashback’. However much like this game, when playing ‘Pitfall’ it’s often hard to tell where you’re supposed to go next especially in the jungle levels. Rich environments may be lovely, but often you’ll have no idea what’s a platform you can stand on and what’s decoration. Similarly, dark stages may establish a mood, but the enemies that inhabit these are often equally dark. You'll frequently find Junior dying seemingly out of the blue because you weren't able to see that he was being attacked. Most of the time, the best way to find a foe is to simply look for the part of the background that is moving. ‘Pitfall: The Mayan Adventure’ is a game that’s essentially good provided you can overlook the many many niggling faults. Individually they don’t seem like much but cumulatively you may well find that this is a game that just ends up irritating to play. Should you make it to the end you’re presented with an adorable ending where Junior rescues his father. 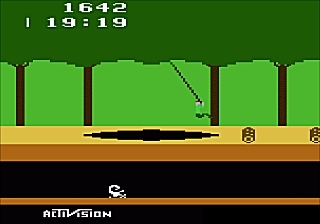 However our first clear view of Pitfall Harry reveals him to be as blocky as he always has been. I find it pleasing to see graphical evolution and I couldn’t help but wonder how Nathan Drake would look in this line up. Clearly the three games are worlds apart visually, but when distilled to their purest form they essentially share the same game mechanics. While ‘Uncharted’ is an incredible flagship series, had it been released 25 years ago it’s hard to imagine it being a game very different to ‘Pitfall: The Mayan Adventure’. However, with Naughty Dog’s incredible attention to detail it would almost certainly be a game lacking the off-putting irritations. What a shame they were making the 3DO’s ‘Way of the Warrior’ in 1994 and not giving birth to video gaming’s most witty adventurer. There is the mistaken assumption that all 16bit games are expensive. While the well none titles can now go for three figure prices, there are still many games you can find for less than £10. It seems the secret to finding a cheap game is to look for one that is mediocre, lost amongst the celebrated and the infamous. While I won’t rush back to ‘Pitfall: The Mayan Adventure’ I have played much worse games and paid much more for the privilege.